Reading the workbook without the video will leave out crucial content (fill-in-the-blanks, teaching, demonstrations). Each participant uses his or her own workbook. (One couple will need two workbooks). In Part 2: Cracking the Code to Handling Conflict, you’ll build on what you learned in Part 1. You will learn - and use - practical tools to manage disagreements, handle strong emotions, and repair your relationship when it’s been damaged. You and your mate will be able to tackle those nagging issues - even the issue of nagging! During the video sessions, you will learn to work through a conflict from “start” (approaching your partner) to “finish” (practical solutions that satisfy both). 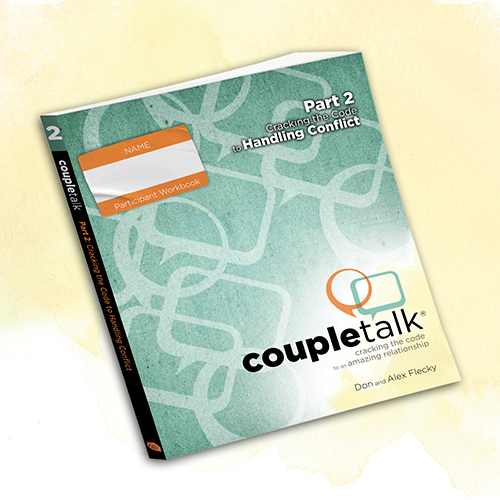 As a result of CoupleTalk, you’ll have better communication, will feel closer to each other, and be able to resolve conflict faster!